Some might think that foregoing one of the final days of late-summer sunshine to spend over five hours cooped up in a theater watching Richard Wagner’s Tristan und Isolde demonstrates either an admirable sense of duty or complete madness. When one has the chance to enjoy music-making of such high caliber in a production that has stood the test of time, however, it feels more like a blessed privilege than a chore. Director Peter Sellars has been known for some seriously wacky opera productions; in one particularly excruciating interpretation of Mozart’s The Magic Flute, all the characters spent their time shooting drugs. 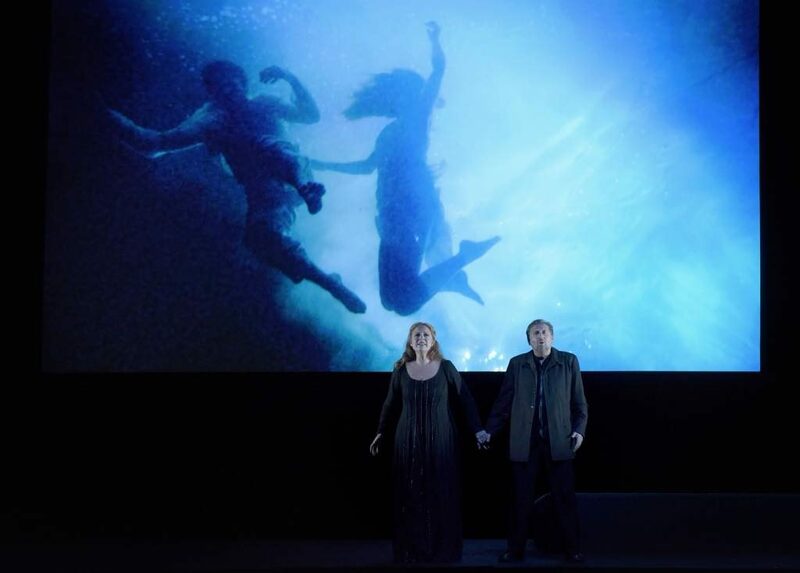 In this production (first seen in 2004), however, his collaboration with video artist Bill Viola manages to rein him in. For much of the opera, the singers are backed up by huge video screens showing either predictable backdrops (like ships on the sea or forests) or actors (in various states of undress) portraying the two central lovers. The screens can be a distraction, but on the whole, Viola’s creative use of water and light enhances rather than detracts from the action; the moving representation of a prone Tristan under an upside-down waterfall in Act III shows Viola at his best. Sellars also makes wonderful use of the vast expanse of the Bastille opera house, with singers and instrumentalists popping up on various balconies, turning the production into an even more immersive experience for the audience. And then there is the music! It is difficult to believe that this opera with harmonies that strain at the limits of tonality – more akin to 20th-century music – was first performed in 1865. The Prelude to Act I is always cited by musicologists as the example of a chromaticism never before explored and was to have an enormous influence upon many subsequent composers. To my ear, however, the Prelude to Act III, with its strange but beguiling tune on a shepherd’s pipe, contains the most astoundingly new harmonies. Conductor Philippe Jordan’s long and rich association with the Orchestre de l’Opéra de Paris fully bears fruit in this production: I have rarely heard it in such good form. Jordan’s tempi are very fast (the rapidity of the opening Prelude came as a shock), but they never feel rushed. An effective Tristan und Isolde requires high-class singers in top form. All the main roles were thrillingly sung in this production. Andreas Schager sings the fiendishly demanding part of Tristan with ease. Martina Serafin as Isolde has real passion in her voice and her acting. I was worried that the strain she showed in her voice during the ecstatic love music of Act II might take its toll on the final “Liebestod,” but Wagner very wisely gives Isolde a good vocal rest for much of Act III, so by then her voice had regained its full power and beauty. The three other main roles featured luxury casting. René Pape seems to sing every major Wagner bass role in all the best opera companies in the world, and it is easy to see why. His King Mark is humane, noble and profound. Matthias Goerne as Tristan’s henchman Kurwenal is not afraid to portray him at the beginning as boorish, adding layers of sensitivity as the opera progresses. It certainly helps that he is such a fine singer of lieder; he shows a real understanding of the words that he sings. The voice of Ekaterina Gubanova, in the role of Brangäne, occasionally felt overwhelmed by the large orchestra, but her singing in Act II as she warns the two lovers of the dangers surrounding them was achingly beautiful. My mark of a good production of Tristan und Isolde usually comes at the devastating end of Act I as the two lovers, having just drunk the love potion, suddenly find themselves face to face with King Mark, to whom Isolde is betrothed. It reduced me to a blubbering wreck.